When it comes to caring for your baby’s precious skin, you shouldn’t have to make compromises. 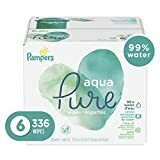 That’s why we made Pampers Aqua Pure Wipes—our only wipe made with 99% pure water and a touch of premium cotton. Caring for your baby’s precious skin is at the heart of our chosen ingredients. That’s why Pampers Aqua Pure Wipes do not contain alcohol*, dyes, parabens or fragrances. The remaining 1% of ingredients includes dermatologically tested cleansers and pH-balancing ingredients to help protect baby’s skin. Aqua Pure wipes are safe for use on newborn babies’ skin—including bottoms, hands, and sensitive faces.